If you’re going to be stuck with one actor for an entire film, James Franco is a good one to pick. In this tale of an outdoorsman who becomes pinned by a boulder, based on a true story, he shoulders practically the entire 94 minute runtime, which encompasses the titular 127 hours in the life of his character. This is director Danny Boyle and writer Simon Beaufoy’s followup to 2008’s triumphant Slumdog Millionaire. I don’t know whether they consciously chose to tell a very narrow story to avoid expectations or not. They do a great job throwing all kinds of story obstacles and visual panache at what is, at heart, a very simple tale of a man pinned by a rock. It is alternately fun, beautiful and excruciating to watch. And not to worry, those who liked Slumdog Millionaire‘s trite uplifting message will also get one here. I guess, personally, I prefer the more complex stories of two other “man vs. nature (a.k.a. man vs. himself)” films. While I was watching 127 Hours, I couldn’t help but think of Into the Wild, which was also about a loner who seeks solitude in nature. For all the flaws of that film (and you can read the litany in my review), the story had the weight of great tragedy. The other film, which is more obscure, but not deservedly so, is Touching the Void. This documentary, using re-enactments and interviews with the real pair of climbers involved, tells a story as harrowing and triumphant as that of 127 Hours, but it does so without resorting to narrative or vfx trickery, and it has the added dimension of a moment where one character must cut the cord that is keeping his friend alive. What that movie has to say about solitude, love and the human will to self-preservation is more powerful and true than the true story of 127 Hours can hope to be, no matter how many helicopter shots and CSI-style macro animations it has. 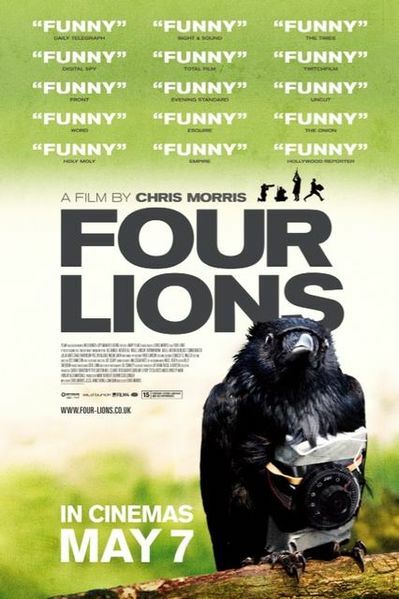 Four Lions is only open in a few theaters in the US right now, but came recommended by the British Independent Film Awards and from playing at Sundance and other major festivals. So me and the thinksploder were eager to get over to Westwood to the one theater in town that is playing it. Written by Jesse Armstrong, Sam Bain, Simon Blackwell and Christopher Morris, directed by Morris, I expected to love the humor of the film. After all, Armstrong and Bain write Peep Show, a show that I find as funny as anything ever put on television. I walked out of the theater trying to convince myself I had enjoyed the film. Don’t get me wrong, the film does have some funny moments. (I laughed hard when a character described peeing into his own mouth.) But there was something in the naturalistic tone of the writing and directing that bothered me. I guess I’m just not ready for a comedy about hapless terrorists. It’s quite subversive how the movie makes you care about these guys. But when one of them is killed, it’s supposed to be darkly funny? Are we supposed to root for them to succeed in their suicide bomb plot? The actors are all great, with excellent comedic timing, but we a consistent sense of how dumb they are. I.e., if it is convenient for the plot or a laugh, they will do something stupid. If it is inconvenient, they will behave as if of average intelligence. I blame this on the script. The big terrorism plot at the end of the film, involving the London Marathon, is neither as preposterous as it could be, nor as tense and full of action. But hey, comedy is subjective and maybe I’m just not the right audience for this film. If I was making a satire of terrorist sleeper cells, I’d use the Dr. Strangelove playbook. I wouldn’t make it gritty and real, I’d make it over-the-top and absurd. It’s not that I don’t think I’m capable of laughing about the subject — Dr. Stranglelove is about nuclear war, which was even more serious when it was released — it’s just that Four Lions picks on a few deluded Muslims, which is much less funny than satirizing the entire mad mad world. One last note: while I thought the cinematography and color grading looked cheap, the visual and practical effects in the film are top-notch. Maybe one of the reasons I took the explosions so seriously is how real they looked. I think Framestore CFC is credited with these. This movie, based on the graphic novel by Warren Ellis and Cully Hammer, is an old-man fantasy. It is passably entertaining, and it wears its sense of humor well. But there’s no pretending it’s not exactly the kind of movie that a man of Brue Willis’ generation will cheer. Willis plays a retired CIA agent who has fallen in love with the woman who cuts his pension checks (Mary Louise Parker). Someone decides he knows too much and he’s forced to go on the run and take her with him. Willis — along with John Malkovich, Morgan Freeman, Brian Cox and Helen Mirren — kicks the asses of people of younger generations and saves the world from danger one last time. Clint Eastwood has already done the same thing many times. It’s hard not to read this movie as the macho men of the Vietnam generation’s lack of apology for Vietnam, lack of taking responsibility for Vietnam’s sequels and their general attitude of compassionless conservativism. This movie hates whining politicians, hates whining arms dealers (Richard Dreyfus) and loves the new breed of CIA agents who kill people off the books on nebulous orders. Sorry grandpa, I rather see Walking Dead than RED. This film wraps up the Millennium trilogy, just as an American remake from David Fincher is in the works. If you hate subtitles, I suppose you can wait. But, as I said in my review of the previous chapter, The Girl Who Played with Fire, I don’t see much of what a big-budget, big-star remake will improve, other than to make these films a bit shorter and with explosions. If the first film was a grim, cold-case mystery and the second film was an action/thriller, this one is a courtroom drama. There are, of course, still moments of intrepid journalistic investigation from co-protagonist Mikael Blomkvist (Michael Nyqvist) and moments of tension where goth hacker Lisbeth Salander (Noomi Rapace) puts her life in harm’s way. But she is sidelined in jail for much of the film, so a great deal of it builds towards a lawyerly confrontation between her and the psychiatrist who tortured her when she was twelve years old. I think, of the trilogy, the second is the best, because of the drama generated by Salander confronting her family — her father’s bottomless evil and her juggernaut brother’s brute force. Here she gets a big confrontation with her brother, but it is anti-climactic, coming as it does after the courtroom climax. Add to that, that you get the sense her brother is not all there, and so any attempt to kill him rather than remand him to legal custody is ethically suspect. The film also misses some chances to play up more internal strife within the government task-force, the section conspiracy and the Millennium reporting team. That said, it’s been a great ride, as I imagine the novels are. (I’ll never read them, since the films are long enough to convince me everything important has been translated to the screen.) This Millennium trilogy is not without the implausibilities of potboiler thrillers — the villain is also a closet Nazi? her friend is a kickboxer? — but it has well-drawn characters and good plot twists. Color me entertained.